Happy Thanksgiving!! Every Thanksgiving morning I cry while watching the Macy’s Thanksgiving Day Parade with Brady. I love the spirit of Christmas so much and it’s a memory from my childhood that I am so grateful to be able to share with my little guy. This Thanksgiving, I’m more grateful than ever for our little family of three. Toddlerhood is hard but the most amazing age. And, I’m also grateful for good friends who’ve encouraged me along this entire journey. Every once in a while a friend comes along who just understands your heart and soul. 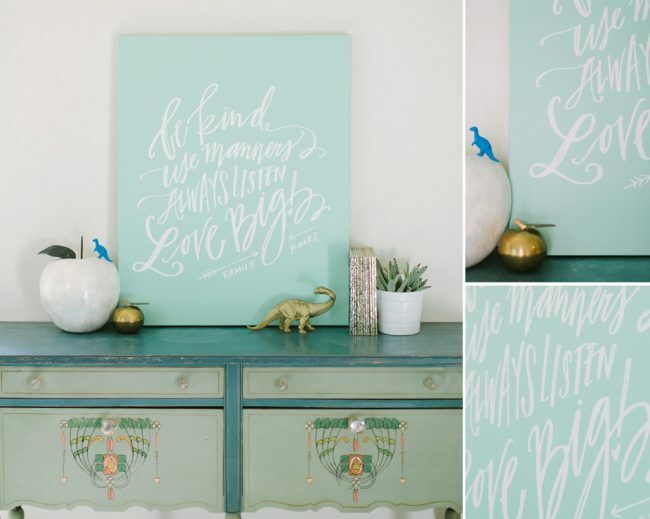 Lindsay Sherbondy, of Lindsay Letters, is one of those gals. We’ve never met in person but we talk via text at least once a week! Her talent as an artist is just unmatched. 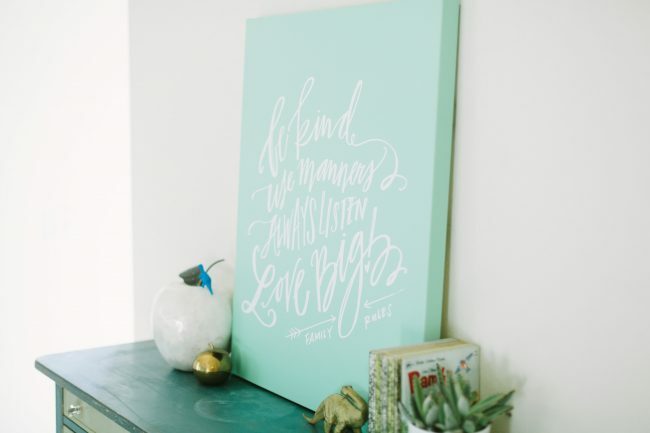 I’m so HONORED that she’s created this beautiful Family Rules canvas for us! A little backstory: a few months ago, when toddlerhood was at one of its most challenging peeks, Bryan and I came up with our “Family Rules.” Be kind. Use manners. Always listen. Love big. Brady repeats them with his cute little toddler lisp alllllllllllll the time. When Lindsay and I started dreaming up a collaboration to work on together, this was the perfect fit. She is also a toddler mama and shares the same heart for what matters most. 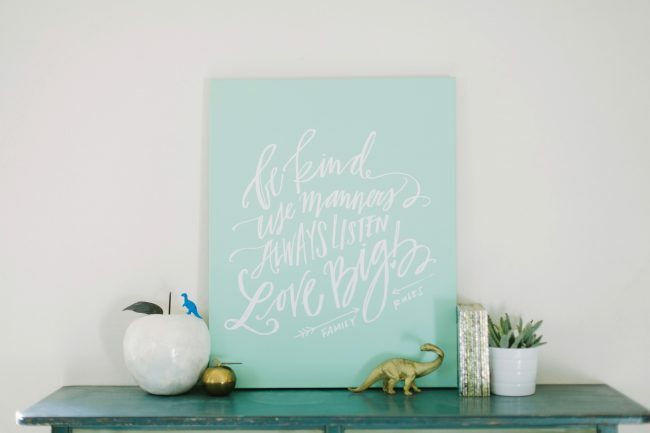 Without further a due, Brady would like to introduce you to our Lindsay Letters Family Rules Canvas! It’s available in three sizes – in light grey, chalkboard (an LL exclusive!! ), mint (seen here) and navy. Each piece is created on 1.5 inch gallery wrapped museum quality canvas. Now available in our shop!